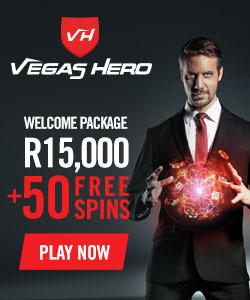 South African players have access to a brand new online casino called Vegas Hero and it certainly appears to be a classy joint. Vegas Hero is positioning itself as the new super hero of the online casino world and is promising to provide a complete new casino experience. Amongst these promises are lightning fast withdrawals, powerful promotions, free spins and incredible bonus boosts. They also offer an awesome welcome bonus for all new players. First Deposit of 100% Match Bonus up to R3,000 + 50 Free Spins. Second Deposit of 50% Match Bonus up to R3,000 with Code: WHERO2. Third Deposit of 25% Match Bonus up to R4,500 with Code: WHERO3. Fourth Deposit of 25% Match Bonus up to R4,500 with Code: WHERO4. The first deposit bonus can be selected by using the bonus drop-down in the cashier section. Please remember that all bonuses come with terms and conditions which are visible when selecting your bonus. The 50 free spins start the day after your first deposit and are allocated in allotments of 10 free spins per day. The above bonus offer is not available to players making a deposit via Neteller or Skrill. You can read the full bonus terms and conditions by following this link. We put Vegas Hero to the test and were pleasantly surprised by our experience. The casino website is well designed and super easy to navigate. The signup process was a breeze and took less than two minutes to complete. Vegas Hero offer players a wide range of casino games from a variety of providers such as Evolution Gaming, NYX Gaming Group, NetEnt, Play’n Go, and QuickSpin. They do offer games from Microgaming but these are not available to South African casino players. Casino games on offer include online slot machines, jackpots, table games, live games, video poker and online roulette. The Vegas Hero Live Casino is provided by Evolution Gaming and offers HD quality streamed tables. Live casino games include Exclusive Blackjack, Dream Catcher, Roulette, High Roller Roulette, Texas Hold’em Ultimate, Stud Poker and many other Blackjack and Roulette variants. If you’re into your standard online casino table games, then Vegas Hero has a lot to offer. There are variants of Blackjack and Roulette too, as well as Casino Hold’Em, Casino Stud Poker and Tai Gow Poker table games. Video slot games are a very popular choice at online casinos and Vegas Hero offers players a wide selection of the latest games from top international gaming providers. Video slots such as Rich Wilde Book of Dead, Starburst, Butterfly STAXX, Gonzo’s Quest, Finn and the Swirly Spin™, Planet of the Apes and many more are available. If you enjoy a dabble on slot games that have progressive jackpots, then you’ll be impressed with the selection on offer. These offerings include Mega Fortune, Hall of Gods, Super Lucky Frogs, Leprechaun Goes to Hell, Cosmic Fortune, and Gunslinger. The casino is owned and operated by Genesis Global Limited who are licensed and regulated by the Malta Gaming Authority. They are also licensed by the UK Gaming Commission which adds to their respectability in the gaming world. 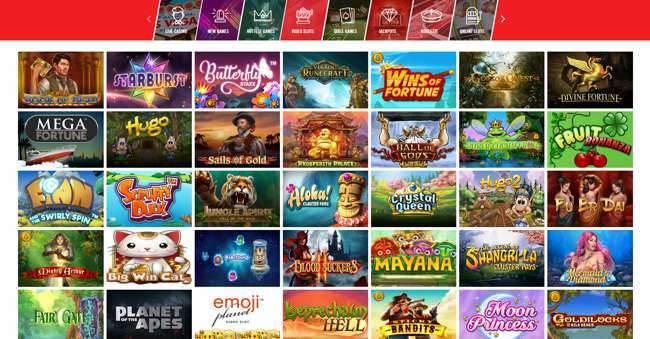 I was very impressed with every aspect of Vegas Hero casino, from the smooth signup process to their great selection of casino games and welcome promotions. The deposit options are also great and include some SA friendly methods. I feel that my excellent experience with them can only improve as they refine and adapt to local market conditions.